IFU: Bacterial Infection Action: It inhibits bacterial protein synthesis by binding to the ribosome. Dosage: Adults serious infections 150 to 300 mg even more severe 300 to 450 mg and for children 8 to 16 mg/kg/day. 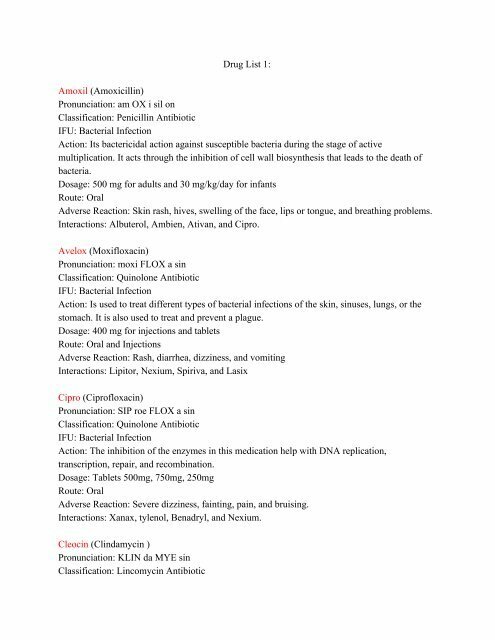 Route: Oral and intramuscular or intravenous Adverse Reaction: Abdominal pain, nausea, vomiting, and diarrhea. Interactions: Zyrtec, Xanax, Omeprazole, and Sofran Keflex​ (Cephalexin) Pronunciation: sef a LEX in Classification: Cephalosporin Antibiotic IFU: Bacterial Infection Action: They stop or slow the growth of bacterial cell by preventing bacteria from forming the cell wall that surrounds each cell. Dosage: Usual dose for oral is 250 mg every 6 hours but a dose of 500 mg every day could be administer. Route: Oral Adverse Reaction: Diarrhea, nausea, vomiting, and upset stomach Interactions: Albuterol, ibuprofen, lisinopril, and metformin. Levaquin​ (Levofloxacin) Pronunciation: LEE voe FLOX a sin Classification: Quinolone Antibiotic IFU: Bacterial Infection Action: It involves inhibition of bacterial topoisomerase IV and DNA gyrase enzymes that require DNA replication, transcription, repair, and recombination. Dosage: Tablets or oral solution is 250mg, 500mg, 750mg every 24 hours. Route: Oral Adverse Reaction: Vomiting, headache, and dizziness. Interactions: Albuterol, lasix, lisinopril, and metformin. Omnicef​ (Cefdinir) Pronunciation: SEF dih neer Classification: Cephalosporin Antibiotic IFU: Bacterial Infection Action: Cefdinir results from inhibition of cell wall synthesis. Dosage: 300 mg q12h or 600 mg q24h 0r 300 mg q12h. Route: Oral Adverse Reaction: Mild itching, skin rash, stomach pain, and indigestion.